First official record: version of the play entered into the Stationers' Register by Thomas Millington on 12 March 1594 as "a booke intituled, the firste parte of the Contention of the twoo famous houses of York and Lancaster with the deathe of the good Duke Humfrey and the banishement and Deathe of the Duke of Suffolk and the tragicall ende of the prowd Cardinall of Winchester, with the notable rebellion of Jack Cade and the Duke of Yorkes ffirste clayme unto the Crowne." 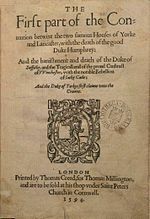 First published: version of the play published in quarto in 1594 as The First part of the Contention betwixt the two famous Houses of Yorke and Lancaster, with the death of the good Duke Humphrey: And the banishment and death of the Duke of Suffolke, and the Tragicall end of the proud Cardinal of Winchester, with the notable Rebellion of Jack Cade: and the Duke of Yorke's first claim unto the Crowne (printed by Thomas Creede for Thomas Millington). This text was republished in 1600 (by Valentine Simmes for Millington) and in 1619. The 1619 text was printed with the 1595 octavo of Henry VI, Part 3 under the title The Whole Contention betweene the two Famous Houses, Lancaster and Yorke. With the Tragicall ends of the good Duke Humfrey, Richard Duke of Yorke, and King Henrie the sixt, as part of William Jaggard's "False Folio" (printed by Thomas Pavier). The 1623 Folio text of 2 Henry VI appears under the title The second Part of Henry the Sixt, with the death of the Good Duke Humfrey. Additional information (publication): scholars are undecided as to the exact nature of the relationship between the 1594 The Contention and the 1623 2 Henry VI. There are four main theories: The Contention is a bad quarto, a reported text constructed from memory based upon a performance of 2 Henry VI; The Contention is an early draft of 2 Henry VI; The Contention is both a bad quarto and an early draft (i.e. a reported text based upon a staging of an early draft of the play); The Contention is an anonymous source for 2 Henry VI. Originally, the bad quarto theory was generally accepted by scholars. First suggested by Samuel Johnson in the original edition of The Plays of William Shakespeare (1765), it remained the predominant theory until challenged by Edmond Malone in The Plays and Poems of William Shakespeare (1790), favouring the early draft theory. In 1929, Peter Alexander and Madeleine Doran re-established the dominance of the bad quarto theory. Scholars have continued to debate the issue since then, with no real consensus reached. The source theory, originated by Georg Gottfried Gervinus in 1849 has fallen out of favour in the twentieth and twentieth-first centuries. First recorded performance: although it is known that the play was definitely performed in Shakespeare's day, adaptations dominated the stage throughout the seventeenth and eighteenth centuries. The earliest known such adaptation was in 1681, with John Crowne's two-part play, Henry the Sixth, The First Part and The Misery of Civil War. Two more adaptations followed in 1723. The first was Humfrey Duke of Gloucester by Ambrose Philips, the second was Theophilus Cibber's King Henry VI: A Tragedy, both of which adapted scenes from 2 Henry VI. Another adaptation followed in 1817, J.H. Merivale's Richard Duke of York; or the Contention of York and Lancaster, which used material from all three Henry VI plays, but removed everything not directly related to York. The earliest known production of the Shakespearean 2 Henry VI was on 23 April 1864 at the Surrey Theatre, directed by James Anderson. Evidence: it is known that True Tragedy (i.e. 3 Henry VI) was on stage by June 1592. It is also known that True Tragedy was definitely a sequel to The Contention, meaning The Contention must also have been on stage by early 1592 at the latest. It is also thought that Henry VI, Part 1 was a new play in March 1592. If The Contention predates 1 Henry VI, the theatrical evidence would place the likely date of 2 Henry VI as 1591.